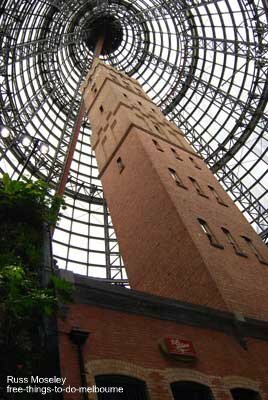 The Shot Tower Museum is located in the iconic Shot Tower building in Melbourne Central shopping centre. .....It's been kept as the focal-point of the shopping centre beneath a massive glass dome. (It's way more impressive than my photo here indicates by the way!). The museum is located inside the tower at the back of the R M Williams shop. Walk through the shop to find it. ........When I first saw the Shot Tower/glass cone I thought it was the best sight in Melbourne and it's still near the top of my list. 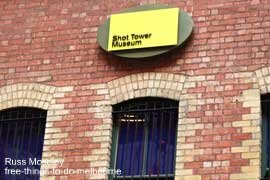 The museum has a section explaining how lead shot was made and has photos of Melbourne as it increased in size in the early days. Access to the shop is via an escalator by the way, so access is difficult if you are travelling with a pram as they're not meant to go on the escalator. 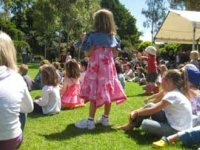 Opening times are 10am-6pm Mon-Thurs and Sat, 10am-9pm Fri and 10am-5pm Sun. Check out the map below to find the Shot Tower. Make it larger by clicking on the blue writing under the map and use the +, - and arrow buttons as required.